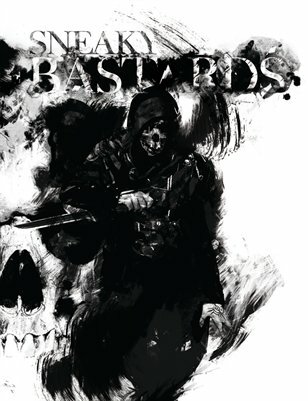 How Thief: The Dark Project’s “Assassins” mission flips the safety of the city on its head by turning the hunter into the hunted. This is a cross-post from Radiator Blog. Thief: The Dark Project and Thief II didn’t have an “open world” structure. They got around this constraint (and arguably, surpassed the “open world” as an organizing principle) by inventing their own level design conventions and expectations. From the very first mission of Thief (“Lord Bafford’s Manor”), there’s always a safe “outside” area and then the actual “interior” you must infiltrate and mercilessly loot. The outside is usually an open space with a skybox, the public space where you can roam outside mansion walls or in city streets with little danger or penalty — your first task is to figure out what to infiltrate and how to do it. 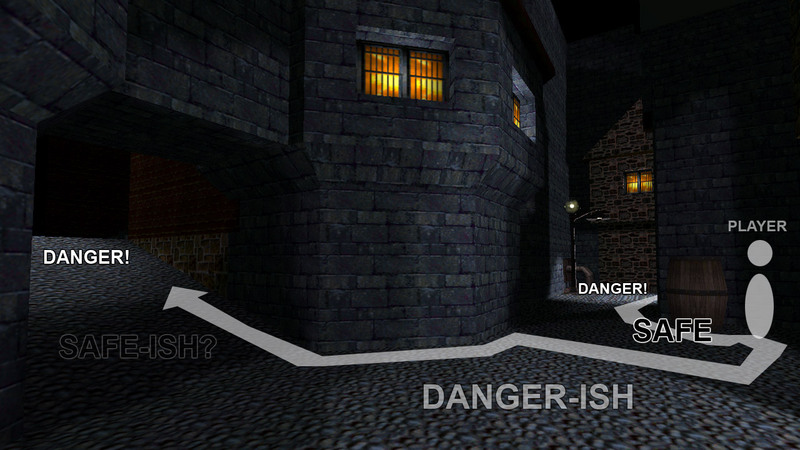 By the fourth mission of Thief 1 (and, what I argue, the best mission of the game) you are pretty well accustomed to this design pattern. And that’s when Looking Glass flips the script a bit. 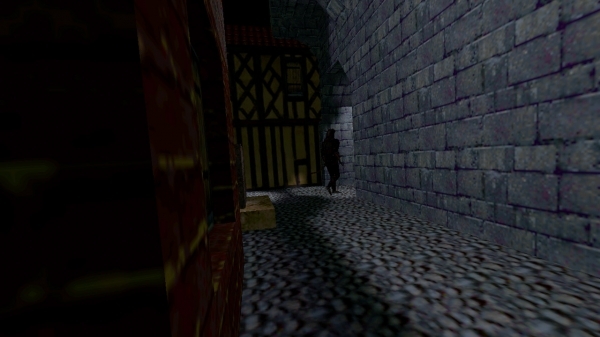 In “Assassins”, you are told to gather supplies and infiltrate a local Hammerite temple… except within the first few seconds, your supplier gets shot in the face (by thugs sent to kill you) and your objectives change to tail, undetected, your would-be assassins through the streets of the City, back to whoever sent them after you. It’s the first time the designers so quickly mislead your expectations with the objectives list. If you’re too noisy, like running on loud metal plates, the assassins hear you and stop. You might fail. Occasionally, they stop and turn around to see if they’re being followed. If they see you, you fail. If you trail too far behind them, you fail. You’re given no feedback when you’re in danger of failing this way, so the tendency is to err on staying closer than falling back. 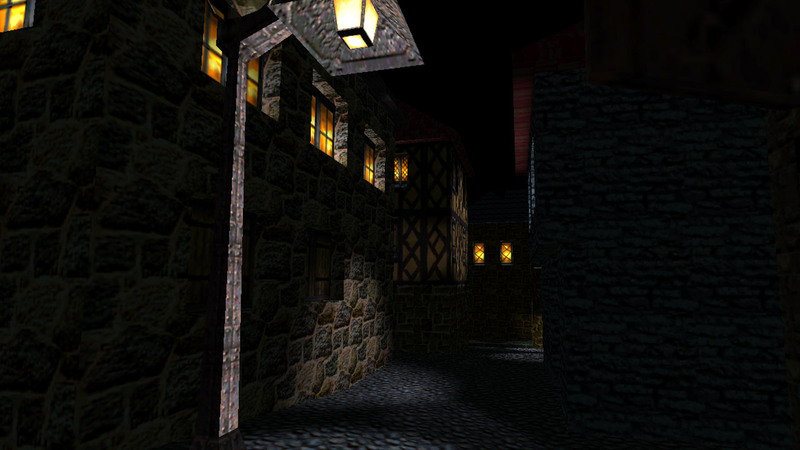 This mission is also the first expansive sense of the City that you get, as a vast labyrinth of narrow medieval streets and alleys without a grid pattern or signage. Most of the light sources are inextinguishable, which means you have to plan your movements a bit more carefully than before. Combined with sparse landmarks, the designers use this part to mess with you a bit. Near the end of the chase, your targets walk through an archway, up a ramp, and turn the corner. The rounded towers offer a wide field of view so you can see a “safe-ish” patch of darkness under the arch, to the left. However, that patch of darkness under the archway is misleading; it’s not really that safe. 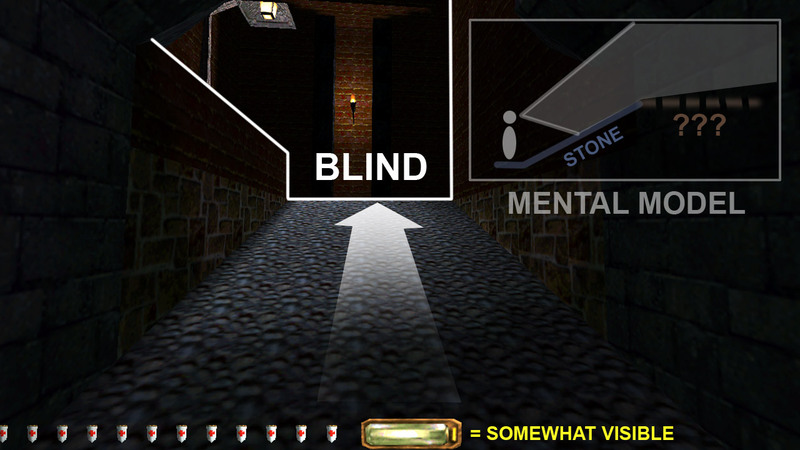 Your light gem indicator will glow yellow, which means from a few dozen feet away an NPC can get suspicious and approach the player, if they turn around. You can’t get much closer through, because the bright street lamp is inextinguishable. Extinguish the torch with a water arrow and rush up to the top. However, we don’t know the floor surface at the top because the incline (plus the fact that we’re crouching) means that we can’t see the floor surface, and the sudden torch extinguishing might make the assassins suspicious. The designers throw you a bone, though: you don’t have to see a floor surface to know what’s there, you can just listen to the assassins’ footsteps instead. So when they turn that corner and you hear the tell-tale clang of boots on metal, you freeze midway up that stone ramp and listen for how many metal steps you hear. A lot of metal steps means a long metal catwalk. That’s the beauty of a footstep mechanic: it translates sound into space and surface. But you only hear a couple metal steps, and if it’s only a couple then you can easily move silently over them by tapping forward. (The designers emphasize the metal stub by putting three different floor materials together, which is somewhat rare in Thief levels. They want you to notice the metal.) This means you can follow a bit closer. 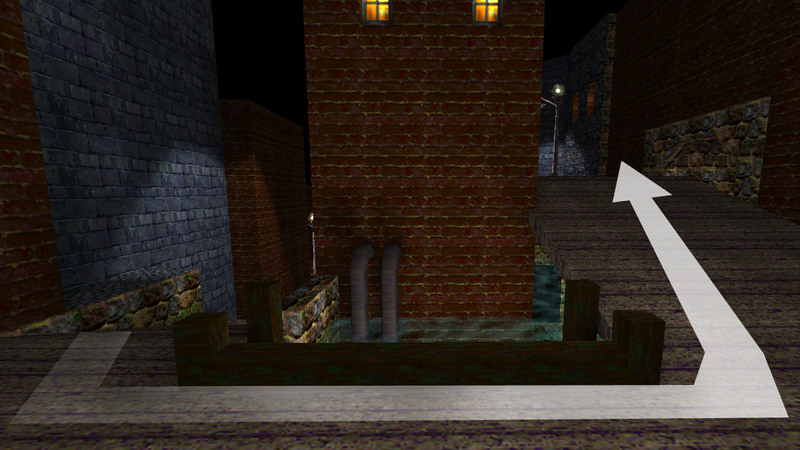 As you crouch-walk up from the left, the assassins are probably watching for you on the ramp on the right. The two pipes in the middle exist only to block your line of sight as you look to your left and cause some mild panic. The designers knew what you were going to do and stacked two different kinds of blind corners next to each other. And that’s just the stuff going on in one 30 second segment in the first act of this mission. It’s why Thief is the “thinking player’s FPS”, because it imbues basic 3D perspective rules with drama and absolutely soaks environments in tension. It’s also why Thief veterans hate how Thief 3 (and probably Thief 4 too) have a third person camera: all that juicy tension about incomplete information never develops and it just evaporates. Though by the end of the city streets section, the designers release the tension. 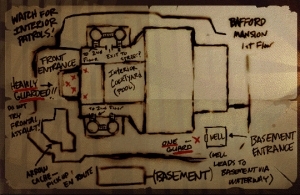 Once you find your assassins’ hideout, a castle owned by some guy named Ramirez, you’re tasked with phase 2 of the mission: robbing him blind. 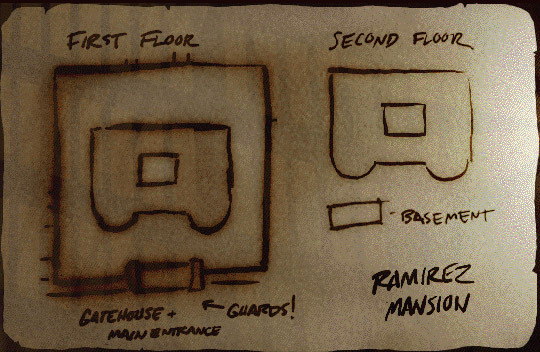 The Ramirez mansion is much easier to solve than the streets. There are only a handful of guards patrolling the top floor, which means you can control the entire area very quickly. In contrast to the really thoughtful city street design I analyzed earlier, this interior floorplan is simple and comprehensible, the main corridors are narrow and arranged somewhat symmetrically, and many of the floors are made of relatively muted stone. 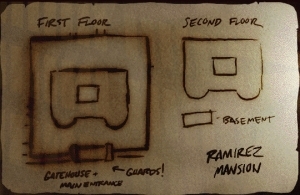 Bafford’s place is much bigger and sprawling than Ramirez’s place. Bafford’s basement is old. Ramirez has recently renovated his basement with an illegal animal pen and office / counting room. Lastly, a readable cements the comparison. In it, Bafford apologizes for being late on payments to Ramirez, which means he’s lower on the totem pole than Ramirez even though his place is bigger and fancier. In this way, Looking Glass uses reading text to complicate reading architecture – whoa. 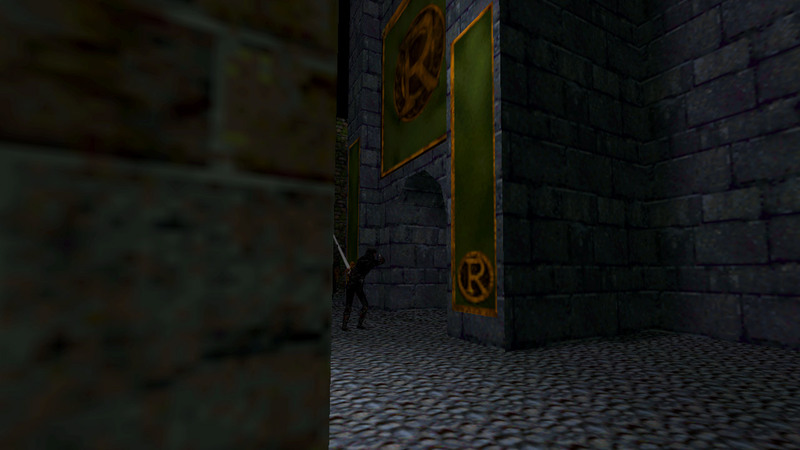 The differences in level design are forms of characterization: the “B” or “R” banners make these spaces private and personal. The oversize and overdecoration implies Bafford is obsessed with just the image of power; meanwhile, the comparatively spartan Ramirez prefers the power of power. When you’re infiltrating these castles, you’re actually sneaking into their heads and learning their secrets and insecurities. Think of it as a proto-Psychonauts style of environmental storytelling, the home as a metaphor for its owner. However, this is also where Looking Glass really dropped the ball. Given the player’s skill level at this point in the game, looting the mansion is so easy that you’ll never trip the alarm. 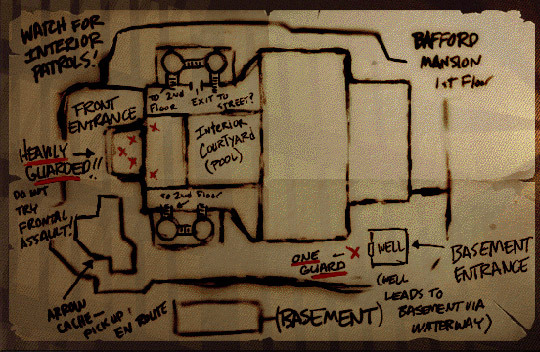 And if you never trip the alarm, the game never triggers phase #3 of the mission: Ramirez sends his guards out into the streets and you have to make it back to your neighborhood. The “get back out” portion of each Thief level is usually pretty trivial as you backtrack through an already-solved level, past the unconscious corpses of so many guards. But here, the game spawns overwhelming odds, about two dozen thugs — more than the number in the mansion! — and they’re all permanently alerted and they’re all looking for you. It’s an unexpected change in stakes and world state. 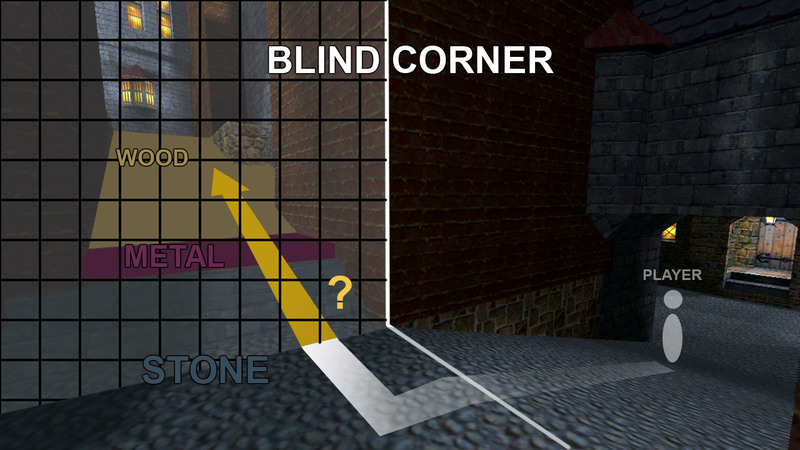 All those blind corners suddenly function very differently when you’re approaching them from the other way. The city streets are familiar and alien at the same time. So, I’d argue that’s how “Assassins” inverts the “City prelude” trope of how every Thief mission begins. The public has now been completely privatized: the public is now dangerous. The City starts the mission as a neutral space. Then it’s a victim, bisected by Ramirez’s private space, a relatively large manor cutting through a dozen city blocks. By the time you leave, the City is your familiar enemy. It’s a full character arc in a 40 minute mission, one of the shorter/easier missions in Thief 1, but still one of the most satisfying and dynamic missions in the series. Few games think about “the functional complexity of public vs. private architectures”, and even fewer weaponise level structure to a narrative effect. That’s why I think Assassins is a classic, even if it’s pretty short and easy. 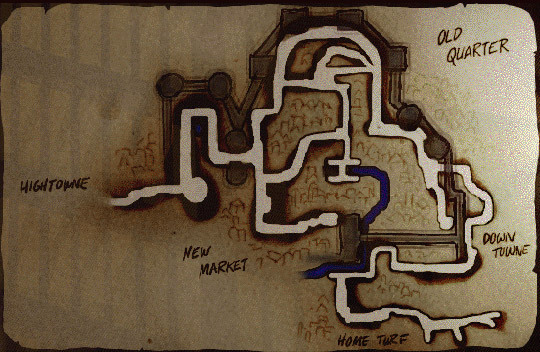 It’s still great level design because challenge/puzzles are just a red herring, a trick to get you to think about the world differently. I knew I had read this ! Great post. I love art history, and I found that the fact you could analyse Ramirez and Bafford’s banner symbol was simply awesome. 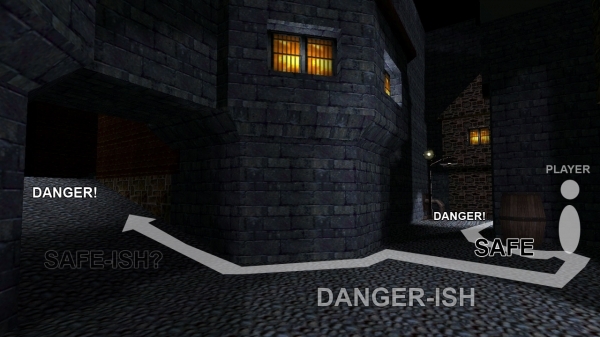 It always amazes me how much detail people can uncover in the level/narrative design of the Thief games. Putting aside the fact that I would be an absolutely horrid level designer, reading stuff like this always takes me from just thinking that a level has been nicely designed overall to realising just how much expert thought was put into crafting them. I wonder how many recent games have this level of depth to their level design. 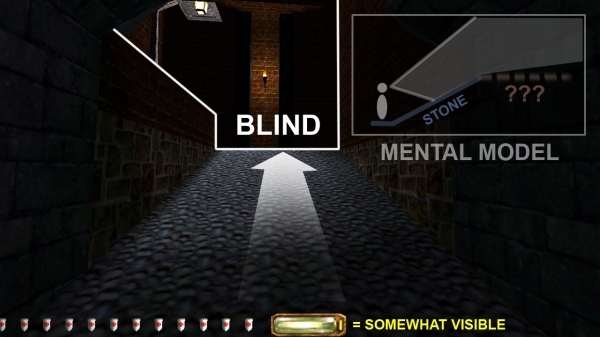 I mean, not knocking modern level designers, because I’m sure they DO put lots of thought into their designs- but the more old games that I play and read about (like Thief and Commandos) just make me realise how shallow some of today’s games are by comparison. Nice post. I also find modern games a bit lacking and too trivial. However, making things look trivial is also hard. I try to push level designers and environment artists for believable authenticity in their work. This gave me the incentive to finish The Dark Project. As much as I love the Metal Age, i still haven’t finished the first game. Really well done article.